Helen is a watercolour artist who enjoys painting the world around her. She often includes an architectural component in her work using ink and wash.Her brush marks are loose and bold giving an impression of what she sees. 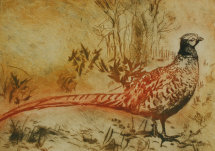 Her most recent work has found her exploring a variety of printing techniques.Many of them are inspired by the amazing fauna and flora of north Devon.